A healthy thyroid is essential for good hormone balance at any age. In many cases, it is also an effective means of weight control. Natural Thyroformula provides natural thyroid hormone precursors (fucus is naturally rich in iodine) and biological precursors (L-tyrosine) combined with B vitamins, zinc, selenium and magnesium, as well as plant extracts with myricetin and kaempferol, which work together to boost thyroid function. This new formulation contains 50% more iodine, three times as much Commiphora mukul and 700 mg of ashwagandha. ¤ Ashwagandha has been added because it is one of the essential ingredients used in ayurvedic medicine for threating hypothyroidism. This traditional use has been supported by studies in which ashwagandha was used in isolation or in combination with guggulsterones. ¤ Guggulsterones, extracted from Commiphora mukul, stimulate activity of the thyroid gland and increase T4 to T3 conversion. This is how they are thought to promote weight loss. Taking guggulsterones also results in less oxidative damage to the liver which is the principal storage site of T4 and of its conversion into T3. The concentration of Commiphora mukul has been increased three-fold to reflect doses used in studies. ¤ Forskoline, extracted from Coleus forskohlii, works by activating the enzyme adenylate cyclase, thus increasing cyclic adenosine monophosphate (cAMP) in cells. One effect of this is an increase in the production and release of thyroid hormones. ¤ Iodine and L-tyrosine are vital for the production of thyroid hormones; the body produces tyrosine naturally from other amino acids, but as we age, production diminishes and supplementation becomes essential. ¤ Myricetin helps preserve and prevent loss of cellular iodine. ¤ Kaempferol, has been shown in vitro to specifically increase enzyme activity of iodothyronine deiodinase by up to 10 times, leading to a 2.6-fold increase in production of T3 active hormone. ¤ Selenium, present in high concentrations in the thyroid, has thyroid-protective antioxidant properties and facilitates thyroid hormone production by promoting conversion of T4 into T3. The decrease in this conversion seen in older people is linked to a fall in selenium levels. Zinc more selectively promotes production of T3 hormone or its more active form, triiodothyronine. ¤ Magnesium, in its readily absorbable citrate form, prevents decreased thyroid activity, both following intense physical exercise as well as in elderly or sedentary individuals. With its exceptional composition, Natural ThyroFormula can help support the body’s general well-being. Other supplements may also be of interest in this regard, such as the patented formulation PEAK ATP™ for restoring energy, and L-phenylalanine, an essential amino acid. To tackle the stresses of everyday life, you could also benefit from the calming effects of L-theanine (Suntheanine®). 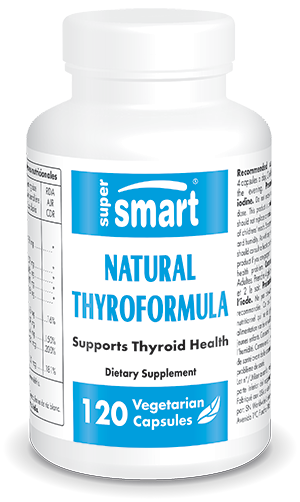 With these improvements, and a higher recommended dose of four instead of three capsules a day, Natural ThyroFormula can now help everyone achieve a healthy thyroid balance even faster. Adults. Take 4 capsules a day, 2 in the morning, and 2 in the evening.